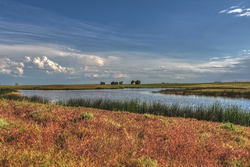 Buyers have the opportunity of a lifetime to bid on 410± acres of premier Colorado goose and duck hunting preserve with a 3,000 square foot lodge, located in Snyder, Colorado. United Strategic Client Services in conjunction with United Country – Schur Success Realty & Auction, will offer the hunting preserve to the highest bidder during an online event ending August 11 at 2 pm MDT. A preview and tour of the property will occur on July 29 from 12 to 4 pm. Property details, photos, online bidding, as well as terms and conditions can be found at ColoradoHuntingPreserve.com. United Strategic Client Services can be reached at 214-945-4556 or by email at mwoodling(at)unitedrealestate.com. Rich Schur the owner of United Country – Schur Success Realty and Auction can be reached at 719-210-6230 or by email at rich(at)successrealtyauctions.com. United Real Estate Group, operating the United Country Real Estate and United Real Estate brands, addresses the unique markets they serve, lifestyle, country and urban, with exclusive marketing, technology and training solutions. Together, the United brands support nearly 500 offices and 6,000 real estate professionals across four continents with a unique, comprehensive marketing program that includes one of the largest portfolios of real estate websites, the largest internal real estate marketing services company, an extensive buyer database of more than 650,000 opt-in buyers, and regional, national and international advertising programs for properties. For more information about United Country Real Estate or United Real Estate, please visit http://www.UnitedCountry.com or http://www.UnitedRealEstate.com.